The care label or tag found on your clothing can be hard to decipher. Unless you are fluent in care label hieroglyphs, you may not know what those cryptic symbols mean. Did you toss your favorite sweater in the dryer on high without thinking or reading the care label? By the time the dryer buzzes, your favorite sweater has probably done some very noticeable shrinking. This method works on most knitted sweaters and other knitted garments. You’ll find it works great on cotton, wool or cashmere. Tightly knitted garments, made of rayon and polyester won’t really work with this method. Fill your sink or bathtub or a bucket with at least 1 quart of lukewarm water. Do not use very hot or very cold water. It should be warm to the touch. Add your conditioner or baby shampoo. Mix in about 1 tablespoon of shampoo or conditioner for every quart of water. 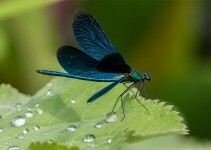 Stir it into the water by hand, until the water becomes slick and soapy. 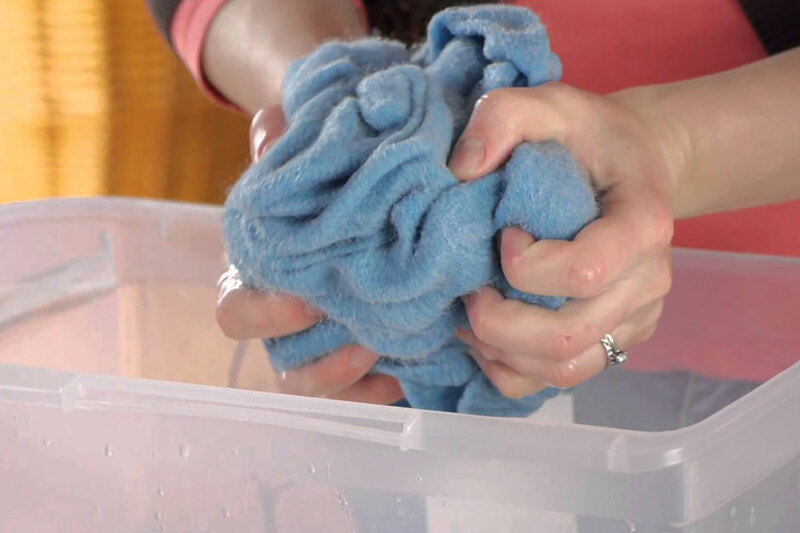 Fully submerge your shrunken sweater into the soapy water. Make sure it is completely covered. Let your garment soak for no less than 30 minutes. If you want to help speed up the process, you can gently stretch the sweater, while it soaks, keeping it underwater. However, stretching while soaking is not necessary. After about 30 minutes, remove your sweater. Roll it into a tight ball and squeeze out any excess water. Make sure you don’t rinse the garment after it soaks. This will allow the soapy water to continue relaxing the fibers, during the stretching and reshaping process. After wringing your sweater out by hand, place it in between two large towels. Lay one towel on a flat work surface. Place your wet sweater on the towel and put the second towel on top. You should have a sweater sandwich, the towels being the “bread” and the sweater as the filling. Begin rolling the towels and sweater, into a tight log shape. Let your sweater sit in the towels for at least 10 minutes. If the towels don’t stay rolled, wrap a rubber band around the ends to keep it secure. When you remove your sweater, it should be damp, but not wet. 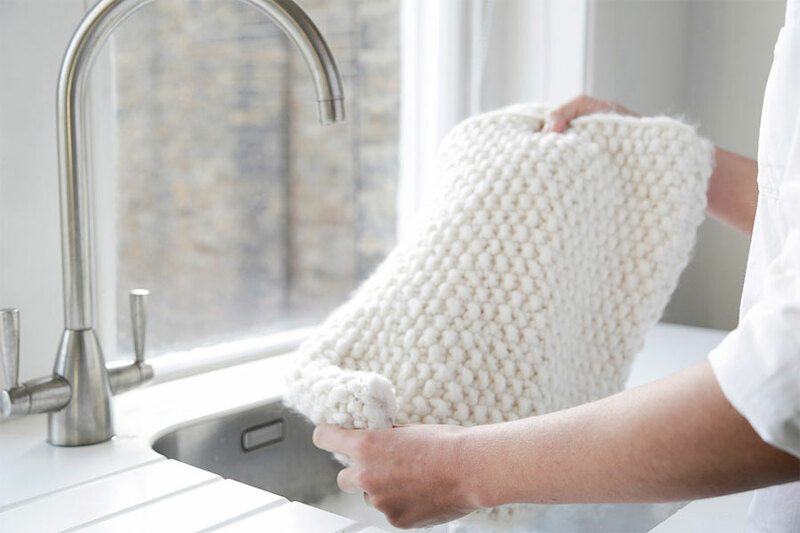 Place your damp sweater on a clean, dry towel. Begin stretching it from every direction. Once you reached the desired shape and length, anchor your sweater in place with heavy objects, clamps or clothes pins to hold it in place. Now, all you need to do is let it air dry. If you notice some unshrinking and are not completely satisfied, repeat this method until the proper size is achieved. This method works best on wool and cashmere sweaters and other garments. You can even use this method on cotton but don’t use it on synthetics or tightly knit natural materials. As in the previous method, you will fill your sink, bathtub or bucket with at least 1 quart of lukewarm water. Remember, don’t use hot or cold water. It should be warm to the touch, about room temperature. Add a 1/2 quart of vinegar for every quart of water. Do not use red wine vinegar. Instead, use white wine vinegar, which is gentler on your clothes than white distilled vinegar. If you are in a pinch, any clear vinegar can be used as a substitute. Fully submerge your sweater into the vinegar mixture. Allow your garment to soak, undisturbed for no less than 25 minutes. Do not begin stretching while the sweater is soaking. After your sweater has soaked, untouched for at least 25 minutes, remove it and wring it dry. Remember, don’t rinse the sweater before wringing it dry. Roll it into a ball and squeeze out as much moisture as possible. Now, take some clean, dry towels and stuff your sweater with them. That’s right. Pretend you’re making a scarecrow. Fill the arms, shoulder area and torso; until it resembles its original shape and size. Get physical with your stuffed sweater. Toss it, shake it and bang it around while the towels are inside, for at least 10 minutes. This will reduce bunching and further stretch the fabric. With the towels still inside, place your sweater on a hanger. Allow the garment to air dry completely. Again, if you notice a small change and are not fully satisfied, repeat this method until the desired size is achieved. 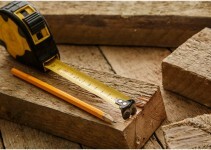 If you don’t mind spending a little cash, there are some store-bought solutions that have been formulated for this very reason. These products, like Unshrinkit and other store-bought formulas, are typically designed for wool or cashmere clothing items. These simple solutions are easy to use and will help salvage your shrunken sweater. Most of these solutions simply need to be mixed with lukewarm water, the garment fully submerged and let soak for 30 minutes or so. Once the timer is up, stretch your sweater by hand and allow it to air dry.